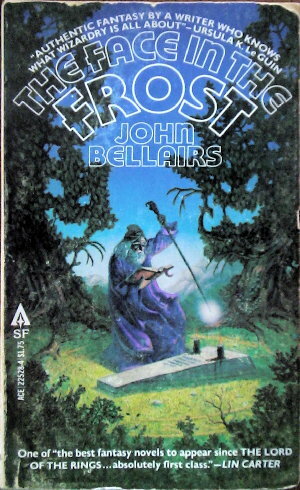 One of the amazing works in Appendix N.
I read a lot of fantasy/science fiction before I started playing D&D. While I didn’t read much of, or even most of, the famous Appendix N, I had read enough related works to have a good idea of where BX and AD&D were coming from. I think one of the important takeaways from that oeuvre is how open everyone was to mixes. We had no problem mixing Herbert with Poul with Norton in our games, and neither did they in their stories. That’s one of the conclusions that Jeffro comes to in Appendix N Survey Complete. Also apparent is that the sheer range of available works was unlimited by time. Jeffro writes that “It used to be normal for science fiction and fantasy fans to read books that were published between 1910 and 1977” but in fact we read things from before 1910. I’d be willing to bet the percentage of campaigns including the equivalents of Morlocks and Eloi was well into the whole numbers, and it is hard not to see the influence of the Island of Dr. Moreau in all the strange creature mixes in home-brew campaigns, or even in the canonical Monster Manuals. It’s also hard not to see the influence of The Three Musketeers and The Count of Monte Cristo in many early adventures. Now, Dumas was perhaps out of the ordinary, because in many ways he was a precursor to modern adventure stories. The Antechamber of M de Treville is an amazing setup, and lays seeds for just about the entire series, all the way through The Man in the Iron Mask . But even besides still-famous genre-ish writers such as H. G. Wells, Alexander Dumas, Jules Verne, Edgar Allan Poe, and Arthur Conan Doyle, pre-twentieth century works were regularly mined and regularly read. I would expect many of us had read Frankenstein, Ivanhoe, and The Picture of Dorian Gray without thinking we were reading ancient history. They were part of the canon because they were great books. Flatland showed up in several short-story collections, and we were familiar with, though these were sometimes a bit hard to find, H. Rider Haggard and William Morris, among others. The Bible itself figured into our reading, too, as can be discerned from some of the spells that Clerics had access to. I’m still working through appendix N, as you can see from my Labrys post from a few weeks ago; it was, in fact, very D&D-ish, with underground levels that appear to open into new worlds but don’t and magic living alongside weird technologies. So I haven’t read Jeffro’s reviews; but the conclusions Jeffro makes from them are interesting. Read the whole thing. Volume 4 of Le Vicomte de Bragellone, also known as The Man in the Iron Mask. Aramis’ plot succeeds or fails. William Morris (24 March 1834 – 3 October 1896) was an English textile designer, artist, writer, and socialist associated with the Pre-Raphaelite Brotherhood and the English Arts and Crafts Movement. He founded a design firm in partnership with the artist Edward Burne-Jones, and the poet and artist Dante Gabriel Rossetti which profoundly influenced the decoration of churches and houses into the early 20th century. As an author, illustrator and medievalist, he is considered an important writer of the British Romantic movement, helping to establish the modern fantasy genre; and a direct influence on postwar authors such as J. R. R. Tolkien. He was also a major contributor to reviving traditional textile arts and methods of production, and one of the founders of the Society for the Protection of Ancient Buildings, now a statutory element in the preservation of historic buildings in the UK. Women are writing science fiction! The never-ending and very forgetful feminist revolution cycle in science fiction. Appendix N Survey last modified October 13th, 2015.